Transitioning from a cot into a bed is a pretty big milestone in a toddler's (and parent's) life, which can seem daunting. As the arrival of our second daughter was quickly approaching we knew we needed to get Isabella out of her nursery bedroom and into her 'big girl' room. Preparing and decorating her new bedroom was a bit of a project, so with only a few weeks until my due date there was a real rush to get her settled. This isn't ideal and is against all the advice I read about how to not make any big changes within three months either side of introducing a new baby into the family. But it was the way it had to be and we had to make it work. We moved Isabella into her new bedroom and into a bed on the same day, which was obviously a lot of change. But we had been setting the scene and preparing her for this change for a good month or so before the big day. Luckily all of this preparation helped and Isabella has now been settled in both her bedroom and bed for over a month without any issues. I can hardly believe it, because like a lot of parents I was nervous of the move and change. Especially as we had the pressure of a baby arriving (which we thought would be pretty soon after the change - if you've followed my pregnancy journey you'll know I went well into the world of being overdue!) that really put a time limit on the process. 1) Talk about the change a lot on the run up - As transforming our spare room into a bedroom was a pretty big project (the joy of an old house!) we started talking to Isabella about her moving rooms and out of her cot into a bed around a month before she made the move. It became something we spoke about multiple times a day, with Isabella often bringing up the topic herself. Every time she walked past her bedroom she wanted to go in to have a look and would talk about not being in the cot anymore. 'Cot for baby' as she'd say, despite us not saying that to her. We didn't want her to feel pushed out of her cot due to the baby (thought we all know that is the real reason), so have been careful not to say anything about needing the cot for baby. I think the fact that her dolls have a cot helped her make the link between the baby in my tummy needing the cot. 2) Make the bed safe - There are a few ways you can do this, but making the bed safe is essential. The last thing you'd want is your toddler to fall out of bed and then become scared or injured. You can buy bed guards to attach to the sides of a bed, but we decided to buy a couple of swimming noodles/horses/woggles (just some of the names I've heard them being called) and pop them under the bedsheet. You can pick them up from leisure centres or buy them online, we ordered them from eBay in the end. We then used duck tape to fix them to either side of the mattress, tucked the flat bedsheet (fitted sheets may not be big enough - worth checking) under the mattress creating a raised edge on either side. This makes it harder for a toddler to fall out of bed during their sleep and it's worked really well for us. Isabella can't get in and out of the bed herself as a result of the swimming noodles, which may be something to consider. 3) Start at nap time - On the day we decided to make the transition we put Isabella down for an afternoon nap in her bed first. This meant there was much less pressure for her to sleep well because we were awake anyway and she was really tired from a morning visiting the farm. Luckily, she settled down straight away and slept for a couple of hours but if she hadn't we wouldn't have been dealing with it in the middle of the night. 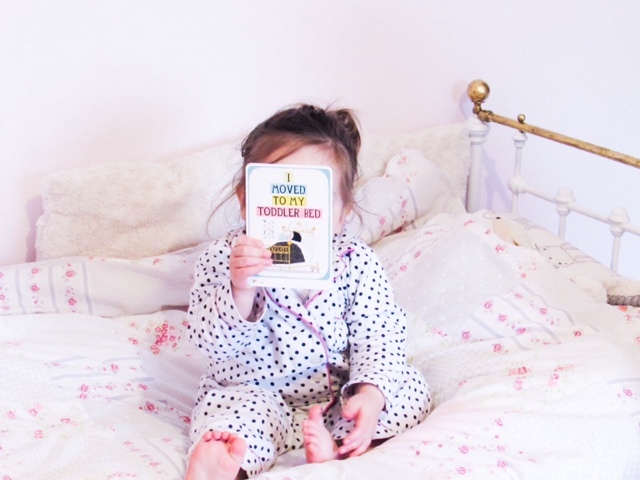 4) Keep their bedtime routine the same - We are firm fans of having a bedtime routine and have had the same one since Isabella was about five/six months old. Our routine is bath (about 3 times a week), milk, book, cuddles and bed. We kept this the same when she moved into her bed, the only difference was that we used to read a book sitting in a chair and now Isabella snuggles up in her bed and we sit on a stool next to her. 5) Keep certain aspects consistent - Isabella's never had any comforters as such (no dummy/cuddly toy/sucked her thumb etc. ), so we couldn't keep any of those aspects consistent. Instead we moved her video baby monitor into the bedroom with her, so that she could listen to the calm waves music she sometimes listened to in her nursery. 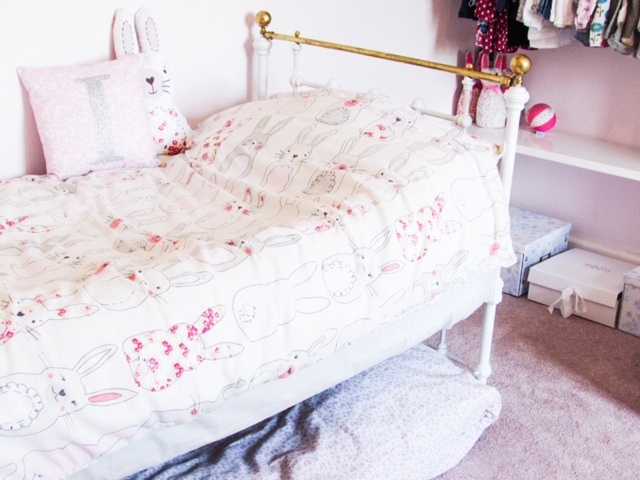 We also moved all of the cuddly bunny rabbits she had in her cot into her bed, as well as the duvet/pillow set. Isabella had slept with a duvet/pillow since December so this wasn't anything new to her. 6) Put a safety gate on their bedroom door - We are in the minority and have never had the need for a stair gate anywhere in the house. The lay out of our house means that the stairs haven't been an issue, but when it came to Isabella sleeping in a bed she could technically get out of we knew a safety gate was essential. It's on the door into her bedroom and allows us to close it when she's sleeping, but also when she's playing in their when I'm doing something that means I can't pay full attention on Isabella (such as, washing my hair/feeding her little sister etc.). It's peace of mind that is well worth it. 7) Make the transition when your diary is relatively free - We looked at what were doing around the time we knew the bedroom would be ready (or whenever you want to make the transition) and settled on a day that we had no plans on or for the next week. This meant we could plan the day around exhausting Isabella in the morning, putting her down for a nap in the bed first and then carry out our bedtime routine as usual. It also meant I was going to be there to put her to bed every evening while she got used to the change. In all honesty I'm pretty much always there (no wild social life here), but we had booked in for an evening spa escape so planned it around that. 8) Lots of positive encouragement - As soon as Isabella woke up from her nap/first nights sleep we showered her with positive encouragement about how well she had done. She clearly felt proud of herself and that she had slept in her 'big girl bed'. That sense of being grown up is very important to Isabella (and toddler's in general I'm sure) and with lots of positive encouragement this feeling is magnified. 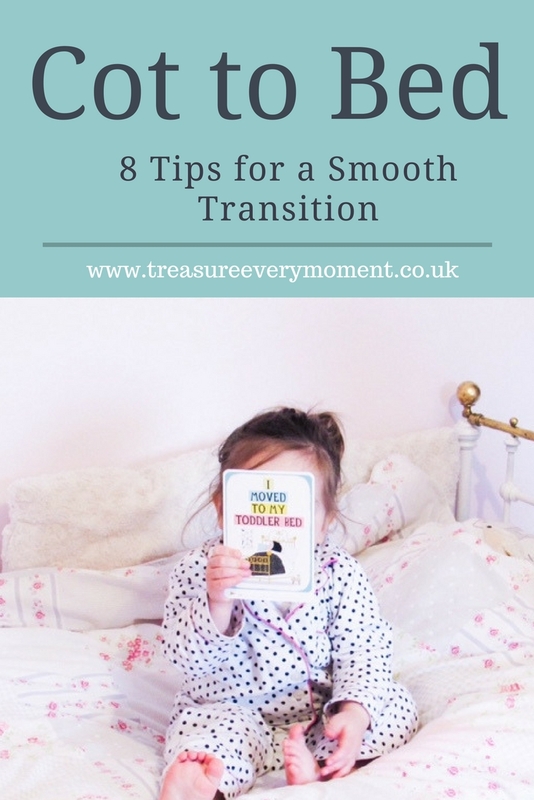 If, like me, you're currently feeling apprehensive about making the change between a cot and bed then I hope these tips help you. The process has been such a positive one for us and I hope it can be for you too. Have your little ones made the change into a bed? I put Madeleine into a bed when she turned 2. And she did AMAZINGLY well. For the first couple of weeks she loved it and she stayed in there and was all for it. Then she got sick and spent a few nights with me in my bed and it was all over. She will not sleep in their now and it got to the point where I had to get her cot back out again for my own sanity! It's a bit annoying having a bed and a cot in her room but I will eventually try again. Some fab tips here I agree communication is super important - talking, praise and routine are the linchpins of getting this right! I dont have children myself but still found myself reading this all the way through! A really imformative article and love your writing style! I adore the bunny bedding 😍 My kids loved going into a big bed, the only problem was getting them to stay in it lol. So glad to hear that the transition is going well! I agree that talking to them before the transition will help them! Planning on doing this really soon. Thanks for the tips. My daughter does not have her own room yet. But I think I would still have her sleeping with me. I can't really remember this very clearly, I don't think it was as big a deal as I expected it to be! Great to read your experience. Both my older girls transitioned without any trouble, my son is now two and a half and still in his cot (there has been no need to change it) but he has just started asking for a big boy bed and so we are thinking of doing it very soon.